You might know me already, in which case Hello! Here I am on the glorious windswept North Antrim Coast. If you have stumbled across me by accident, you might want to know a bit about me, my background and my writing. OK. Well I have just published my second novel and now I’m keen to share my experiences and my books, of course. 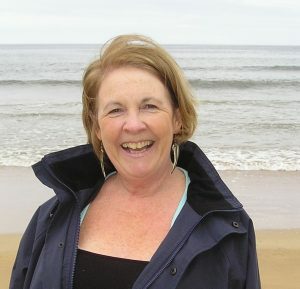 I grew up on a farm in Northern Ireland, along with my eight siblings, all different and although I could write a book about each of them, most of it is probably best left untold. 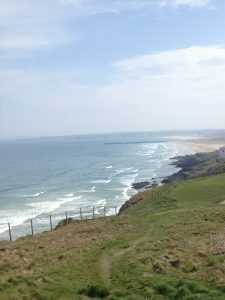 Nearby Castlerock, the setting for several scenes in both novels. My first foray into freedom, after surviving the strict convent school expectation of vocation, was to nursing. A student nurse in Belfast at the height of what is now called ‘The Troubles’, I led an exciting and sometimes dangerous, but never dull, life. I made lifelong friends during those years and some of the experiences of those years are scattered within in my novel, ‘Time for a Change’, which was published in May 2018. I worked as a General Nurse and a Midwife in Belfast, then as a Health Visitor in Derry/Londonderry during the hunger- strike years. By the early eighties I had scarpered off to Jersey, in the Channel Isles, as I had an appetite for a more comfortable living. My career took me to unexpected places and I published extensively in academic and nursing research ( Clinical Effectiveness and guidelines). Now I’m learning the difference between fact, fiction and pure fiction! I have also travelled the world and had an opportunity to learn from other cultures and peoples – rich pickings for an aspiring writer. 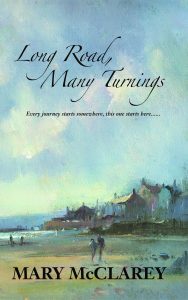 Writing my first novel ‘Long Road, Many Turnings ‘ turned four years worth of private thoughts, storylines and research, mostly developed in a darkened room, into a public document. It is akin to walking down the street naked, in a street where all your friends and family will see you! But like a genie, once out of the bottle there’s no going back in. That first book has its own life now and the characters seem to have won the hearts of many readers. 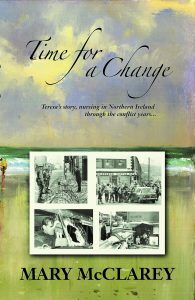 I was so often asked ‘ Where did Bailey go’ or ‘What was Agnes up to?’ that I simply had to write the sequel ‘Time for a Change’. I hope you like it. Click the book covers to see more details. I’m currently working on my third novel, which will be based on my great- grandmother’s story, and the first of the trilogy. It promises to be quite a revelation! Thankyou for staying with me until the end of this page, I hope this encourages you to read more about my books on the next pages. Or to write your own?